You can make these little bites entirely vegan and alcohol free as well. 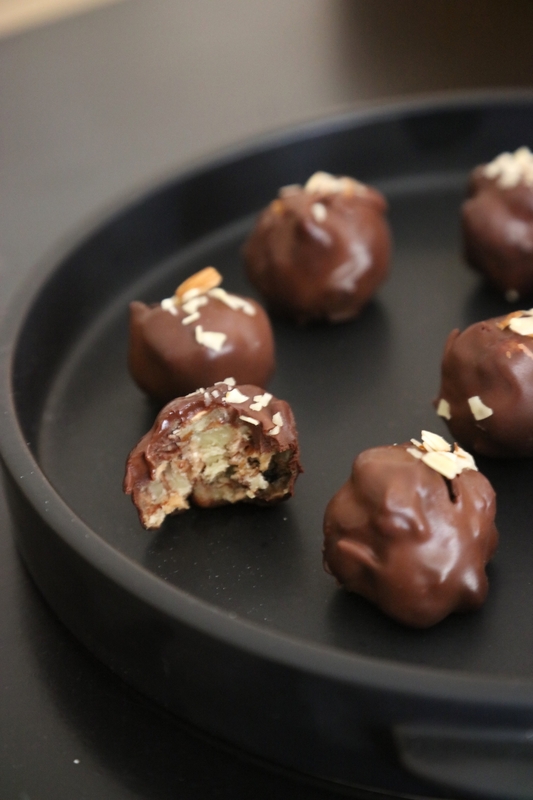 These are unevenly shaped and are more like rochers than truffles. You will need toothpicks, foil and parchment paper. Combine both the raisins or cranberries, cinnamon stick, rum, apple juice and brown sugar in a saucepan and cook on a medium flame until most of the liquid has evaporated and you have a soft sticky mixture. Remove and discard cinnamon stick. Cool mixture completely. Stir in orange liqueur or juice until well incorporated. Rub your hands with butter or margarine and roll the mixture into 8-9 balls. The balls will be uneven because they contains nuts and raisins. Lay the ball out on a tray covered with parchment paper. Stick a small toothpick into the centre of each one. Cover tightly and refrigerate 2 hours. Heat the sugar, milk and cream in a small saucepan. When it reaches a boil remove from the fire and quickly stir in all the chocolate. Keep stirring to agitate the chocolate about 1-2 minutes with a spatula. Add an extra 1/2 oz chocolate and stir till it melts- this will help temper the chocolate so you have a shiny coating. Stir in the oil or butter. You should have a shiny and smooth ganache. If it is too thick add in a little more milk and stir vigorously. Pour this into a small bowl with a depth of 3 inches. Hold the truffle by the toothpick and dip into the sauce. Coat it all over. Then hold it above the bowl and let it drip for a bit to get excess chocolate off. This is will take a minute or so. Return it to the wax paper with the toothpick still stuck inside. Repeat this for all the truffles. Slowly pull out the toothpicks. You can hold the truffle down with an extra toothpick as you pull the toothpick out. Drip a little ganache to cover the hole where the toothpick was using a teaspoon. Sprinkle with nuts. Cover the truffLes with foil and refrigerate 2 hours or until you are ready to eat them. Remove from fridge, place in small paper cases or if you prefer straight on to a small serving platter. Let sit 15 minutes before you serve them.